If you’ve been reading this blog for any amount of time, you would probably know that I am a fitness coach with Beachbody and workout just about everyday. I started coaching in 2010 and since that time we have lived in 4 different houses. Each one was, at the time, exactly what we needed and didn’t really have any room to spare. That didn’t really matter much and my workout room was usually out in the living room. It was, however, definitely a challenge to be working out in the middle of the living room or, when we lived in a 2nd floor apartment, even more difficult. We all know the floors in apartments are not all that thick or sound proof and you can literally hear every footstep that someone takes if you have an upstairs neighbor. And, of course, workouts are even more noisy and I occasionally got complaints from the neighbors no matter how much I tried to not make too much noise. In my defense, it was not like I was working out at 5am or anything.. it was seriously in the middle of the day or after I got home from work at like 4pm. 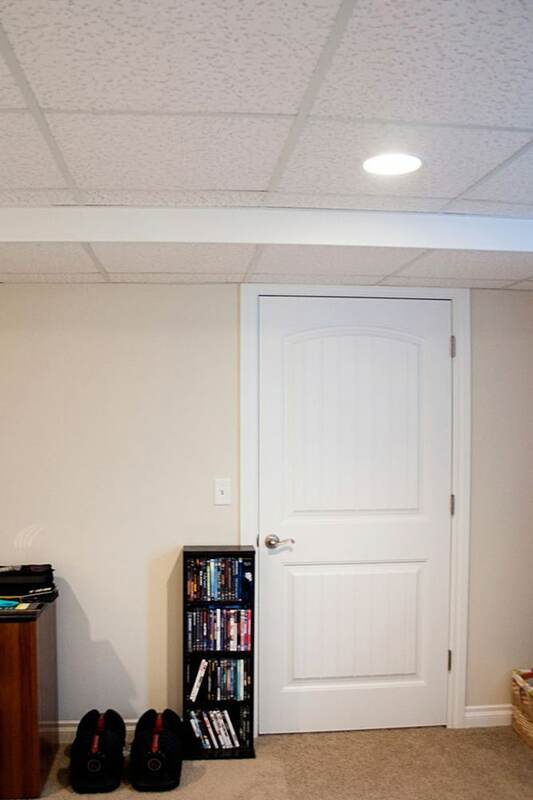 When we found out we were moving to Michigan I was excited about the thought of a basement. Living in the south my whole life (even the 2 other states we lived in were in the south) meant we didn’t have that extra basement space. So I was really excited to find a finished basement so that I could take my workouts downstairs, in their own room, and not disturb anyone else in the home. We ended up finding the perfect home for us -at the time- with just enough extra space in the basement for my workout area, a guest room, and an office. Score! When we moved in, my workout collection had grown almost out of control and I didn’t know what to do with it. So I just stuck it in some baskets in the corner of the guest room/workout space and left it at that. Eventually I started getting tired of always having to bend down to pick up my weights or resistance bands and basically just having stuff thrown in a corner. But since I am still limited to just a corner I needed to try and make the most of the space. I really only need the corner to store my stuff then the rest of the room is for the guest suite with the bed, TV, etc. I also wanted to try and make it look more intentional and “nice” since the room does serve dual purposes and we do have guests frequently. Finally I broke down and bought the SelectTech weight stand and then the corner remodel just snowballed from there.The hubbs and I took a trip to Ikea one afternoon and I found that awesome mirror (to check my form, haha) for the wall, I found the resistance band hooks at my local hardware store in the closet section, and yoga mat holder on Amazon. The yoga mat holder is actually a wine holder but it fits yoga mats perfectly and looks nice. I think it turned out pretty amazing and it’a a wonder that I had all that stuff hanging on the walls now just shoved in those little baskets on the floor. Seriously, how did it all fit in there? Eventually, when we move into our forever home, I’ll have my own workout room and not just a corner but this does the job for now and has everything that I need right at my fingertips. Plus, if any of my guests ever want to workout, they have all the equipment and DVD’s that they could ever ask for right there for them to utilize.